Hundreds of farmers from villages that are likely to be affected by the proposed nuclear power project in Mitihivirdi, Bhavnagar, on Tuesday, walked out of the public hearing on the project environment impact assessment (EIA) report. They have been opposing the proposed nuclear power plant (NPP), with six light water reactors (LWR) of 1000 MW capacity each, since the project was announced on the grounds that it would cause irreparable damage to environment there. The NPP at Mithivirdi is proposed to be set up 40 km from Bhavnagar by Nuclear Power Corporation of India Limited (NPCIL). The site identified for the project is located on sea coast on west side of the Gulf of Khambhat, and is spread across 777 hectare. On Tuesday a public hearing over the EIA report prepared by the Engineers India Limited (EIL) was held at Navagam near the proposed site in Mitihivirdi under the chairmanship of the Bhavnagar district collector V P Patel. An entire team of NPCIL officials were also present during the public hearing. They also made presentations with regard to the NPP. As many as 4,000 farmers from villages of Jaspara, Mandva and Khadapar opposed the NPP claiming that it would harm the environment and affect their livelihood. They further claimed that land of their villages would be lost due to the project. Over 78 per cent of land to be acquired for the project is agricultural land, while 19 per cent is wasteland and over 2 per cent is forestland, according to the EIA report. "We have already registered our protests since the power plant was announced in Mithivirdi and we stick to our demand that we do not want nuclear power plant here. Today, we demanded that farmers be allowed to speak first before the EIL presentation. But our request was declined. Therefore we walked out of the public hearing. The government was trying to suppress over voice," said Shaktisinh Gohil, sarpanch of Jaspara village. A major portion of the land for the NPP is proposed to come from Jaspara village, which is about 749 hectare. Gohil further claimed that the EIA prepared by EIL was flawed and did not cover all villages within the 30 km radius of the proposed plant. Villagers had further claimed that since EIL was not accredited to conduct environmental assessment for nuclear plants, the report prepared by it should not be considered. Gohil claimed that he had support of 24 villages which fall under the 30 km radius of the proposed NPP, and with their support they plan to take their agitation to next level. Bhavnagar collector V P Patel said that though there was no obstruction or disturbance during the public hearing, number of farmers registered their protest over the NPP and walked out of the hearing. "Some submitted opposition in writing while some verbally expressed their unwillingness for the NPP," Patel told Business Standard. "Nearly half and hour after the proceedings began, number of farmers walked out," Patel said. He said that the administration's job was to hear the views and prepare a report which would be sent to the ministry of environment and forests, New Delhi. Meanwhile, officials of NPCIL countered villagers allegation on EIL saying that the National Accreditation Board for Education and Training (NABET) has already issued a certificate allowing EIL to continue with the assessment. EIL's application for accreditation to conduct EIA for NPP is under review of NABET, NPCIL officials said. As per the draft EIA, out of 777 hectare a total of 603 hectare area falls under agricultural land (both kharif and rabi) and the remaining land includes waste land, forest, scrub land and water body. 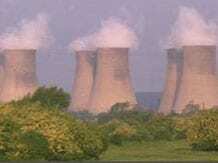 The proposed nuclear power plant will be executed in three stages. The Stage-I will complete in 2019-20 followed by Stage-II in 2021-2022 and Stage-III in 2023-24.